Your favourite place It’s too hard to choose just one, between the cirques and the volcano. I’m happy as long as I’m in the countryside. For three days, we roamed the roads of the island exploring its coastal landscapes. All in all, just over 400 kilometres on the clock and just as many unforgettable moments. Here’s a little glimpse into our logbook. 9am ​ : ​Off we go. 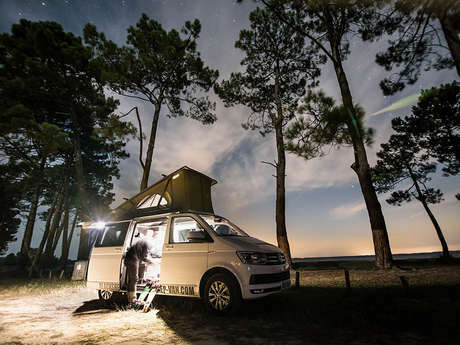 ​ We have an appointment with Franck, in Saline-les-Hauts, to pick up our camper van. As this is our first trip in a van, we have plenty of questions. Driving tips, safety regulations, equipment on board, for nearly an hour, we cover everything. The first surprise: we are astonished to find everything we need, from the kitchen to the fridge, not forgetting the real beds and the dry toilets (ouch)​. Franck uses this time to share his top tips and his favourite spots. Once we've done the inventory on the tablet, we’re ready to go. Let the adventure begin. 10am - 13KM: Check the temperature of the ocean. ​First stop: Trou d’Eau beach, in the commune of Saint-Paul. It’s the ideal spot to relax, but also to try all sorts of activities such as paddleboarding or a transparent kayak. Then we head towards the neighbouring commune, to cool off at the Pointe des Trois Bassins snack bar. Just sitting in the small open air amphitheatre is enough to let yourself be lulled by the dance of the waves. On the road to Saint Leu, we admire the paragliders, who land directly on the beach. It's lunch time already! On the menu, a local toasted sandwich, on the hoof, so we can enjoy this first day to the maximum. Next we move on to the two most popular sites in Saint-Leu: Pointe au Sel and Le Souffleur blow hole. On this part of the coastline, the ocean flirts with the old lava flows. The spray is engulfed there, to form all kinds of spectacular "geysers"! After a dip near the little port of L'Etang-Salé, we head towards Le Gouffre abyss. The place takes its name from the lava corridor in which the waves crash dramatically. 5pm - 58KM: The Saint-Louis Mosque. ​ On the island of "Living Together", the beauty and the diversity of religious buildings is always striking. The Blue Mosque in Saint-Louis, inaugurated in 2002, is no exception. We arrive just in time to hear the call to prayer, from the 33 metre high minaret. 6pm - 67KM: Watching the sunset in Saint-Pierre. ​The capital of the south is known to be particularly lively once night falls. So this will be our last stop of the day, to enjoy a drink on the sea front. That evening, the Reunion sky is on fire and gives us one of the most beautiful sunsets of our trip. 9.30pm - 108KM: Shall we sleep in Saint-Philippe? 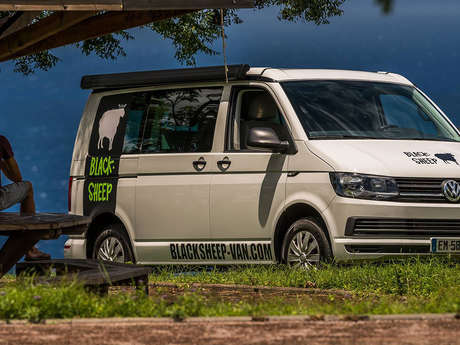 ​This is the best thing about a trip in a camper van. When we planned our trip, we had intended to sleep near Saint-Pierre. But when Franck told us how much he loved Puits Arabe, in Saint-Philippe we decided to change our plans. In the car park for this place, which is very popular with picnickers, there is nobody else there when we arrive. We take the opportunity to try the solar shower! 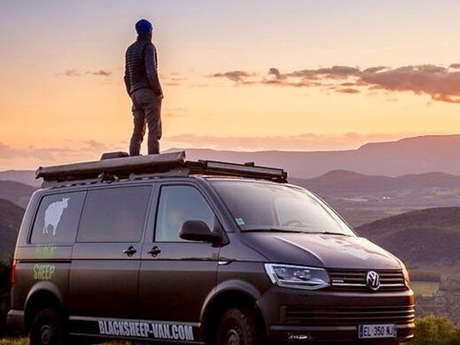 In swimsuits, we shower at the back of the van, using the ecological products given to us by BlackSheep. There is not a cloud in the sky and no light pollution - it’s our first shower under the stars! Then it’s the time to lift the roof which houses our bed, which is surprisingly comfortable: it’s almost like being at home, with the shooting stars and the noise of the waves as an added bonus! 5.30am - 108KM: Sunrise at Puits Arabe. ​ Sitting on the old lava flows, in the shade of the screw pines, we admire the sun coming out of the ocean, right in front of us. At this time in the morning, there are only a few fishermen and walkers to interrupt the singing of the birds. 8.30am - 134KM: Back to Saint-Joseph. ​ As we changed our plans for the previous night , we had to pick up our tour of the island where we broke off. Back to Saint-Joseph to discover another geological curiosity on the island: Cap Jaune. A short walk takes us there from Marine de Vincendo, where we also stop to walk on the black sand beach. After a few minutes of walking, the Cap appears. It is the lava and ocean clashing together which has given this 50 metre high cliff its ochre colour. We take our time to fully enjoy the place and the tropicbirdsthat soar overhead. 12pm - 164KM: Gargantuan lunch at La Case Volcan. ​This restaurant, a few metres from the start of the lava route, in Le Tremblet, was recommended to us by Franck. And it is without doubt one of our best meals on Reunion Island! Here, you taste the whole menu before ordering! Juice and dishes are presented in small glasses and ramekins, and once you have tasted everything, you just have to choose your favourite dish, to enjoy as the main course. For me, it was “boucané papaye”, and for himself, sausage rougail. A real treat! 2.30pm - 181KM: On the roads of the East. ​ After a post-lunch stroll on the lava flows, we head towards Sainte-Rose. The town is known for being home to Notre-Dame-des-Laves, a "miraculous” church, which was surrounded by lava when Piton de la Fournaise erupted in 1986. This region of the island is home to a number of iconic churches. We stop at the church of Sainte-Anne, known to be one of the most beautiful on Reunion Island. To finish off our evening, we visit Mr. Lebeau, in Saint-Benoît. The Reunionese love grilled meats, and his were warmly recommended. While the chickens are being grilled, we spend some time chatting with the owner, whose big blue eyes widen in amazement when I explain to him that this evening, we are sleeping in a van. It’s true that we have not gone unnoticed since driving on board our California, and people’s curiosity is the ideal way to start up a conversation! We feel like great adventurers! We choose to spend the night in the heart of the Reunion Island National Park, in the Bras-Panon hills. This time, we are alone in the world - this place is a paradise for travellers. 5.30am -228KM: ​The night could not have been more peaceful. ​ ​We are up and out again watching the sunrise. From this Eden, we can see the whole of the East coast, from Saint-Benoît to Sainte-Suzanne. As we descend back down to the coast, we stop at the viewpoint where we can admire the Cascade du Chien. There is green as far as the eye can see. 9.30am - 243KM From the East to the North. ​Once we arrive on the coast, we set off to explore the Hindu temples of Saint-André. This commune in the East, where there are lots of islanders of Tamil descent, is home to brightly coloured temples not to be missed, such as Colosse and Petit Bazar. We continue driving to Sainte-Suzanne, where we discover the famous Niagara waterfall. Easily accessible, it’s the ideal place to admire one of the most beautiful waterfalls on the island. A few kilometres away is the Bel Air lighthouse, the last one remaining on the island. Next we head to Sainte-Marie, through the cane fields. In Saint-Denis, we stop in Le Barachois and then in rue de Paris, to admire the traditional Creole houses. 12pm - 275KM​ To get back to the West coast, we decide to take the Mountain road. Taking the coast road would be too "quick" and we decide to put the van to the test on the hairpin bends of this iconic road. We take advantage of the lay-bys to admire the breathtaking view of Saint-Denis. It is already 2pm when we park at Domain Fleurié for lunch and to take a nap in the cool, fresh air of the hills. Well-rested, we take to the road again heading to La Saline, to find Franck. We have just enough time to pass through the towns of La Possession and Le Port. One final stop at Étang Saint-Paul, in the shade of the coconut palms, and it’s already the time to return the van keys. 5pm - Back to where we started​ With our tours and detours on the island, the clock is showing almost 400 kilometres more than when we set off! We meet up with Franck and take great delight in telling him all about our adventures - until the next time! Freedom: a real feeling of being self-sufficient and independent.